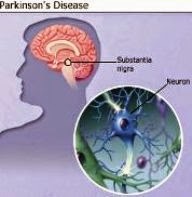 Parkinson's is a degenerative disease of the brain that affects the nerve cells involved in movement. Beginning an activity may be difficult as the person affected is rigid and slow to get going. But once started people with Parkinson's speed up and move too fast, ending up almost running or out of control. Parkinson's is caused by the loss of brain cells that produce dopamine, an important neurotransmitter (a chemical that carries signals between the neurons in the brain), which enables us to perform smooth, coordinated movements. A person with Parkinson's will only develop symptoms once around 80 per cent of these cells are lost, so they may have had the condition for some time before problems come to attention. • A condition known as REM behaviour disorder (where people act out their dreams by kicking, hitting or talking during dream or REM sleep). Among the first movement problems to be noticed are a fine resting tremor in an upper extremity or clumsiness in one hand (20 per cent report this first). With time, the disease may become more difficult to control and less responsive to drugs. Other problems such as depression and dementia may also set in. There's no cure for Parkinson's disease although new research is just starting to suggest that some drugs already used for the condition do have some effect in holding back progression of the disease. A lot can be done to relieve symptoms, especially in the early stages, by replacing the missing dopamine in the brain. This can be done very effectively with a drug called levodopa - a synthetic chemical that's converted into dopamine in the brain. However, there can be severe side-effects with prolonged usage. Because of these problems, doctors usually try to delay using levodopa, especially in younger people. Instead, they use other drugs that boost dopamine activity or mimic its effects, known as dopamine agonists. These drugs also have side-effects and doses have to be carefully tailored to each patient's needs. Another option for people with more advanced Parkinson's is injections of a drug called apomorphine which can 'rescue' people from sudden 'off' periods (episodes of greatly reduced mobility). This drug can also be given as a continuous infusion for those with severe movement fluctuations and reduces the dose of levodopa that a person requires. Occupational therapists and physiotherapists help people manage their condition by assisting with movement and providing advice on how to maintain independence in everyday life. Speech and language therapists help with communication or swallowing difficulties. Deep brain stimulation is a form of surgery that can be used to treat some of the symptoms of Parkinson's. A wire with four electrodes at its tip is implanted in one of four target sites in the brain. Then a small unit, which generates electrical signals for the stimulation, is implanted into the person's chest. When the stimulation is switched on, electrical signals are sent to the brain to stop or reduce the symptoms of Parkinson's. It's not suitable for everyone with Parkinson's, but can provide significant improvement in symptoms and quality of life. In the future, gene therapy and stem cell therapy may hold some possibility of more effective treatment of Parkinson's disease. Carers play a vital role in the assistance of a person with Parkinson's disease. A carer might be a partner, daughter, father, son or a Parkinson's disease nurse specialist (PDNS). PDNSs work with patients to understand their requirements and take control of their condition from diagnosis onwards. For example, they provide clinical monitoring and medication adjustment, are a continuous point of contact for support and are a reliable source of information for patients and carers alike.